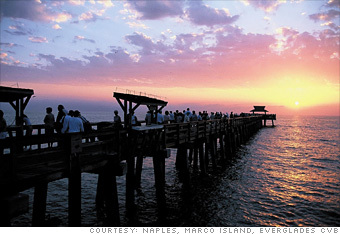 Residents of these 25 counties enjoy some of the highest life expectancies in the U.S.
Collier County, which includes the city of Naples on the Gulf coast, is the picture of Florida leisure. By land area, Collier is the largest county in the state, and 80 percent of it is devoted to parks and nature preserves. Any kind of water-related recreation or exercise you can think of is readily available. Naples has long been a destination for artists: Take a class at the Von Liebig Center or just work your way through the county's 100-plus art galleries. You can also take in a show-or star in one-with the Naples Players, which is recognized as one of the nation's top community theaters. Source: Life expectancy stats from consultant Bert Sperling of BestPlaces.net, Centers for Disease Control.